Stay ahead of the class with a carrier-class, fiber-driven network that enables learning without limits. BYOD, tablets, e-learning, content streaming, conferencing—the list goes on for the mounting pressure educators face in providing exponentially growing bandwidth needed to prepare students for tomorrow. That’s where we come in. Conterra Networks is one of the most respected broadband providers in K-12 education, supporting more than 1.5 million students, teachers and administrators for 15+ years. Our fiber-based infrastructure delivers the fast, reliable and scalable solutions that help educators meet the demands for bandwidth, including full support throughout the E-Rate process. Bandwidth with no limits is a more effective education environment—the next-generation network for the next generation. Our MTTR (mean time for repair) ≤ 4 hours. With video lectures, online assessment, learning, and collaboration tools, educators need high-speed bandwidth that connects classrooms, educators, and administrators. Contact us Today at 877-365-6701 to start building your custom solution. 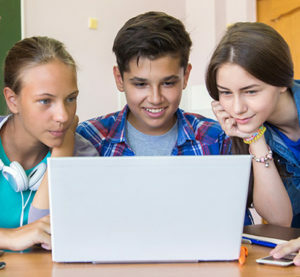 The E-Rate program has been helping U.S. schools and libraries connect to the Internet since 1997. Authorized under the Telecommunications Act of 1996, E-Rate is the largest federal education technology program and is overseen by the Federal Communications Commission (FCC). In 2014, the FCC approved a $1.5-billion annual increase for the E-Rate program to help schools pay for broadband connectivity and network infrastructure. The FCC made a number of changes to the program that provide economic incentives to schools and libraries. Millions rely on our networks every day. We partner with and support K–12 organizations through the E-Rate process. For more information about the E-Rate program and how we can help, click here. Conterra participates in the California Teleconnect Fund. To learn more, click here. Copyright © 2019 Conterra. All rights reserved.